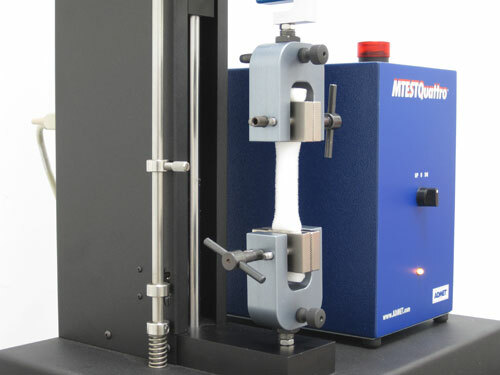 Why is Tensile Testing important? Tensile Testing: What is it? 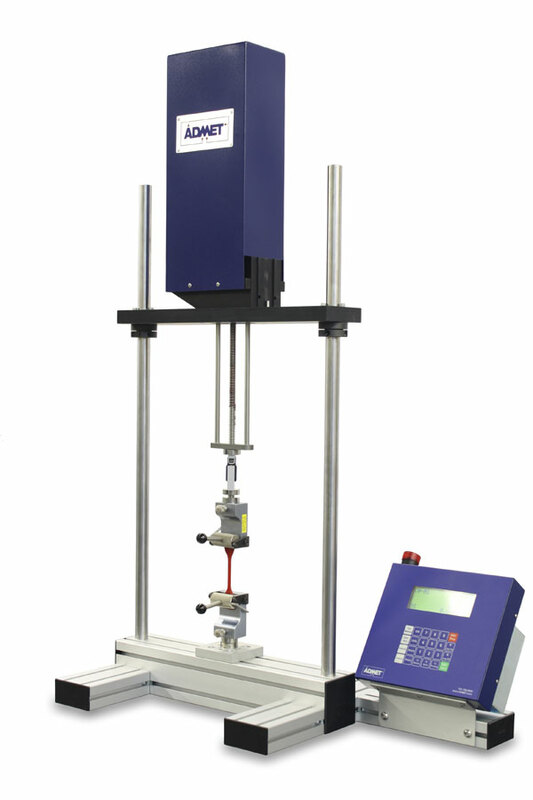 Tensile tests are used to determine how materials will behave under tension load. 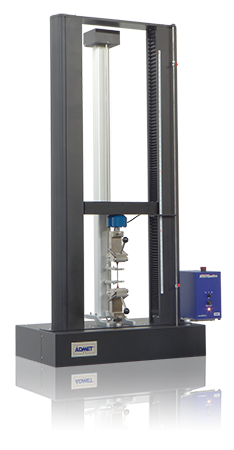 In a simple tensile test, a sample is typically pulled to its breaking point to determine the ultimate tensile strength of the material. 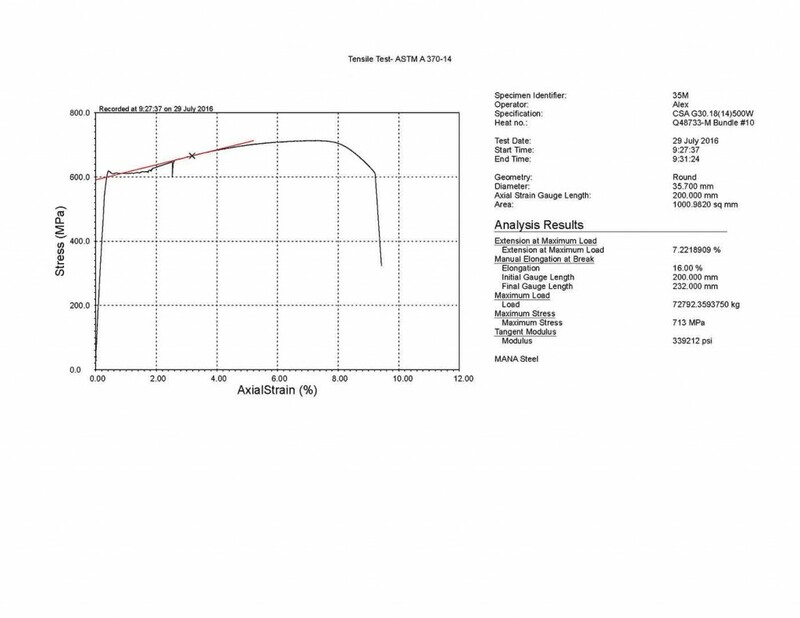 The amount of force (F) applied to the sample and the elongation (∆L) of the sample are measured throughout the test. Material properties are often expressed in terms of stress (force per unit area, σ) and strain (percent change in length, ε). To obtain stress, the force measurements are divided by the sample’s cross sectional area (σ = F/A). Strain measurements are obtained by dividing the change in length by the initial length of the sample (ε = ∆L/L). These values are then presented on an XY plot called a stress-strain curve. Testing and measuring procedures vary based on the material being tested and its intended application. 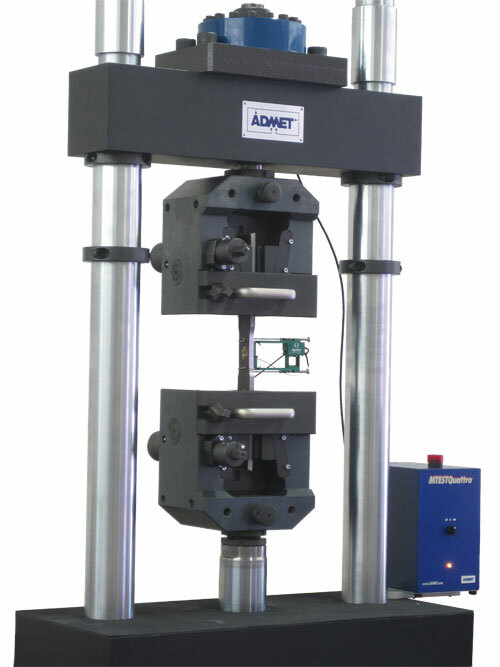 ADMET material testing systems perform accurate and reliable tension tests / tensile tests. 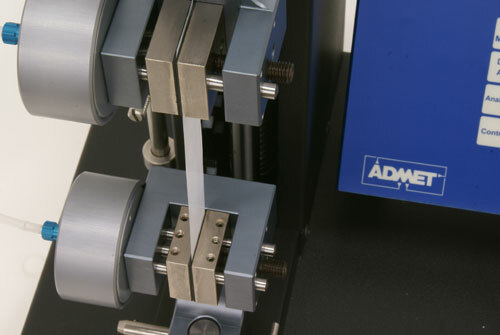 Our systems are ideal for measuring the tensile properties of metals, plastics, textiles, adhesives, medical devices and many other products and components. 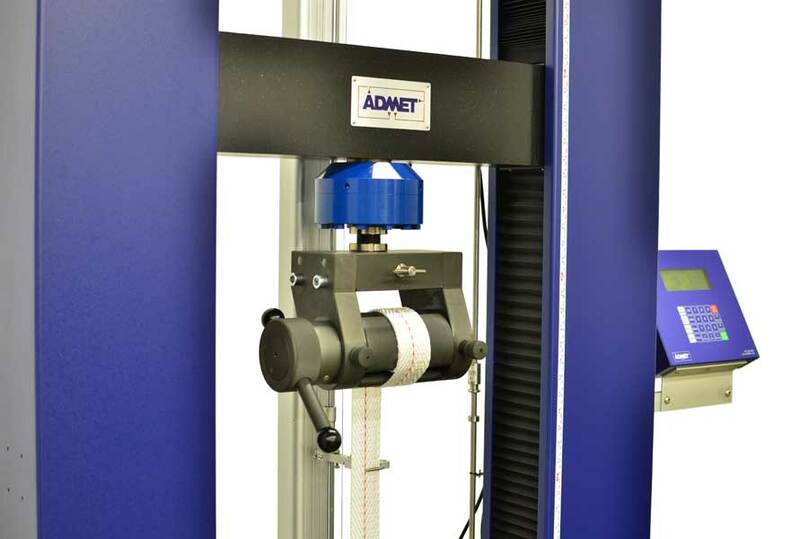 As they pull materials apart, ADMET testing machines accurately calculate mechanical properties such as tensile strength, peak load, elongation, tensile modulus, and yield. 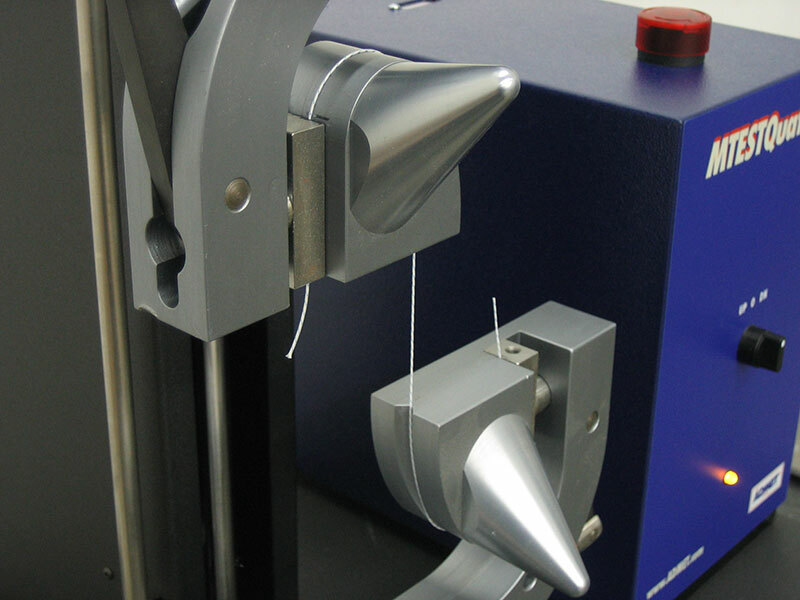 Tensile testing is critical for selecting appropriate materials during research and development. 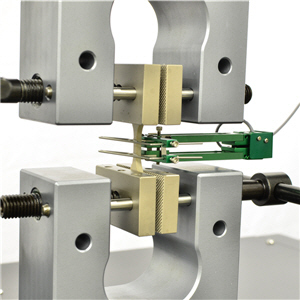 Tensile testing can also be used to verify that materials adhere to minimum strength and elongation requirements. From suspension bridge cables to safety harnesses, lives may depend on the quality of your materials and products so conducting accurate and reliable tensile tests is an absolute necessity. Consequences of not adhering to high standards can be severe both in monetary and human costs. Usage of improper materials may result in destruction of property and significant loss of life. The costs of disasters brought about by utilizing substandard materials usually far exceed the costs of carrying out regular tensile testing. 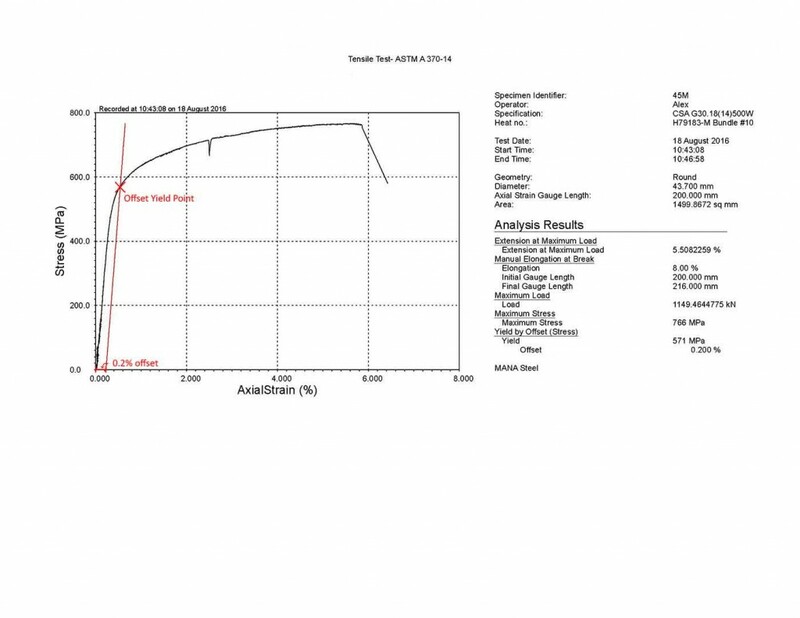 The following section will address key ideas related to tensile testing. 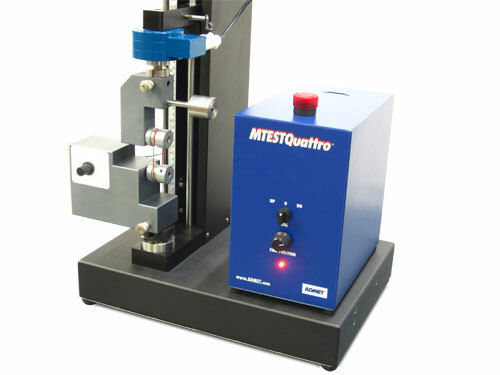 All software output screens are from an ADMET MTESTQuattro-equipped tensile tester. These are basic dimensions of material science. Stress is the amount of force per unit cross sectional area. Strain is the ratio of the change in length to the original length, sometimes expressed as a percent. 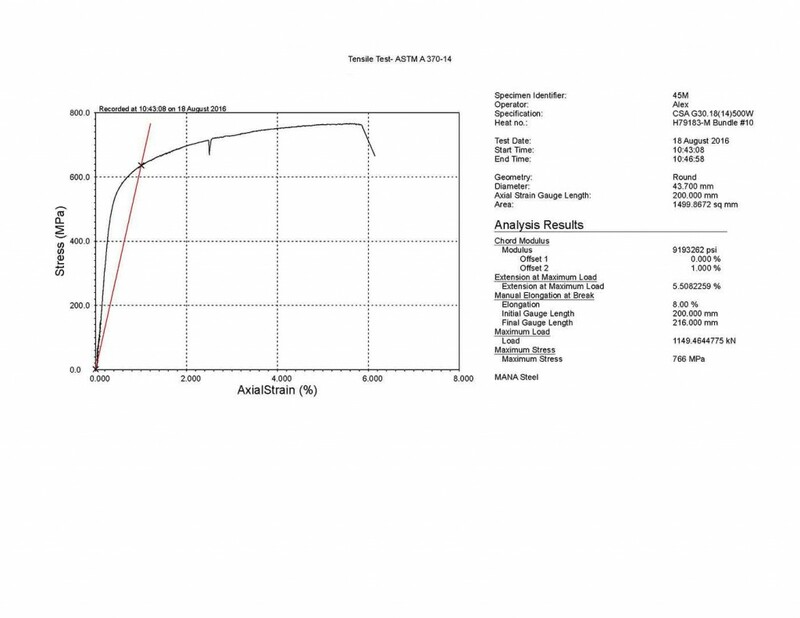 Tensile tests use plots of stress vs strain to display results. Elastic deformation is the region on the stress-strain curve where deformation can be reversed by removing stress. It is also the region where stress is mostly proportional to strain. It can be identified on a stress-strain curve as the initial linear section of the graph. Young’s modulus, also known as the elastic modulus, is the constant which relates the proportion of stress (σ) to strain (ε) under elastic deformation. On a stress-strain curve, it is the initial slope of the linear region of the graph. This relation is represented by the equation σ =E•ε. This relation is referred to as Hooke’s Law, which was developed to represent the behavior of springs. The first instance on the stress-strain curve where the plot begins to deviate from the line marking Young’s modulus. This deviation is often gradual and is dependent on the material. Strain beyond the material’s yield point induces strain hardening, which permanently deforms the material and causes changes to its mechanical properties. The yield point marks the end of the elastic deformation region and the beginning of the plastic deformation region. It is characterized by a sharp bend in the stress-strain curve at the end of the elastic region. Materials that exhibit no definitive end to the elastic region do not have a yield point. In those cases, yield is approximated by the offset method. However, it can only be determined experimentally by loading and unloading, gradually increasing stresses to find where plastic deformation begins. For materials that do not have a clear end to the initial linear region, the offset method is used to approximate yield. The offset method uses the stress-strain curve of the material and overlays a line with a slope equal to the initial slope of the stress-strain curve. The line is offset along the strain axis, usually by 0.2% (the line crosses the strain axis at ε = 0.002). The offset yield point is determined as the point of intersection between this line and the stress-strain curve. The ultimate tensile strength is the maximum amount of stress a material can withstand before failure. This is the maximum value on the stress-strain curve. Tangent modulus is used to approximate the slope at a given point on the stress-strain curve. The graph shows an exaggerated example. Refer to ASTM standards when selecting points for a tangent modulus. Chord modulus is used to approximate the slope between two specific points on the stress-strain curve. The graph shows an exaggerated example. Refer to ASTM standards when selecting points for a chord modulus. Some materials do not have a linear region to their stress-strain curve, therefore Young’s modulus cannot be determined directly from the curve. The secant modulus is used in its place as an approximation. Secant modulus takes the slope of a line which intersects the origin of the stress strain curve, and a point on the curve. 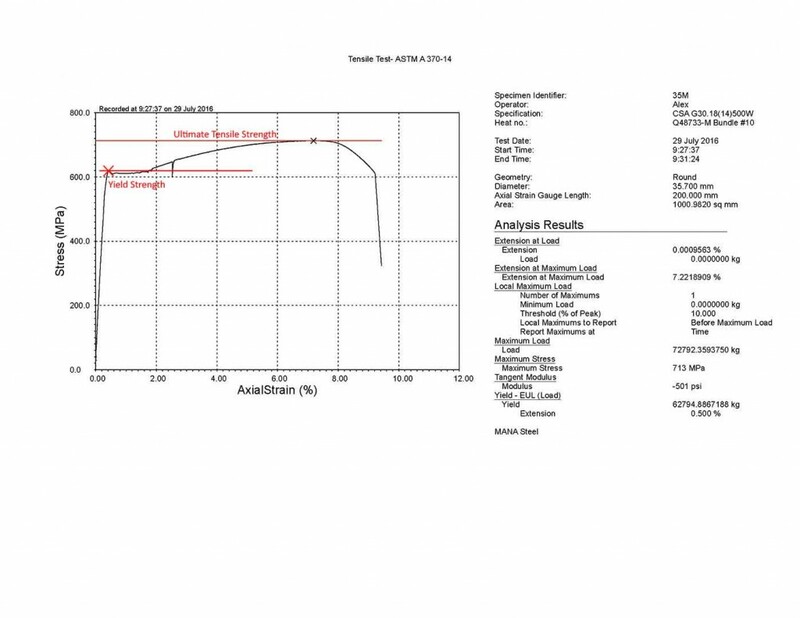 One example is described in ASTM D5323, which calls for the point to be placed at 2% strain (ε = 0.02), but the position of this point can vary by material and procedure. This method is most useful for material comparison. This graph shows an exaggerated example. Refer to ASTM standards when selecting points for a secant modulus. 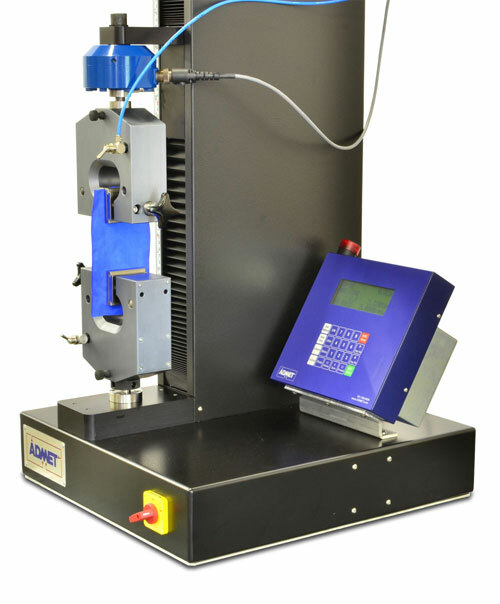 The universal test machine frame provides the structure and rigidity needed to pull the sample apart at the desired rate. Frames are available in both electromechanical and servo-hydraulic configurations with a wide range of capacities. It is important to select a frame which can withstand the amount of force needed to test the sample. 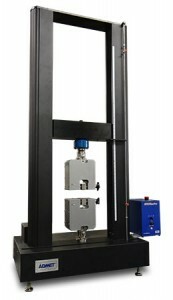 Load cells measure the amount of force being applied to the sample. Like frames, these come in a variety of capacities. Choosing a load cell with a capacity below the required breaking strength will result in the load cell breaking before the sample does. 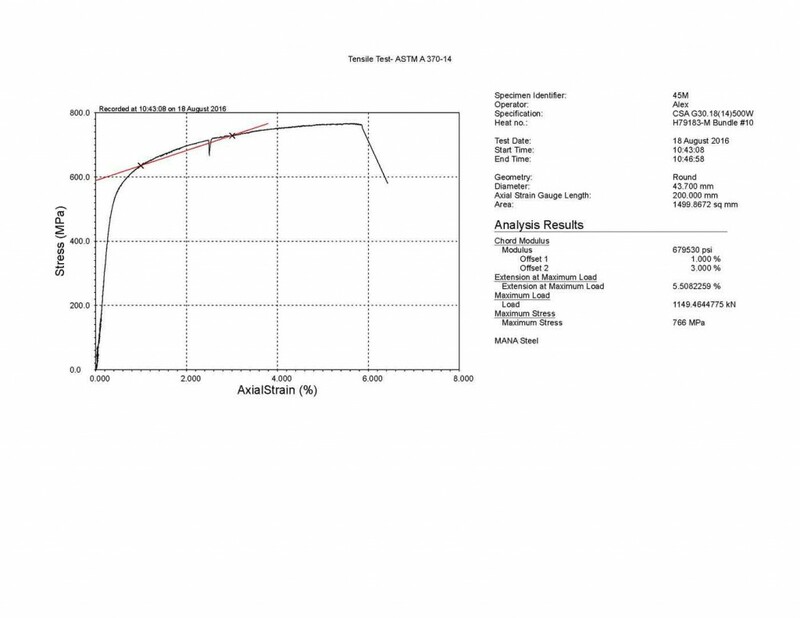 Conversely, a load cell with too high a capacity will lead to test results that may lack the precision desired as resolution of load cells typically goes down to 1%. 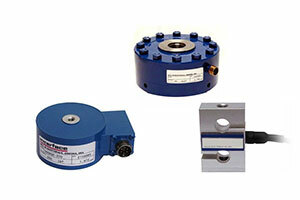 For example, a 1,000 lb load cell would be far too high a capacity for a sample that breaks under 1 lb of force. Depending on your system setup, you may need a controller or an indicator. 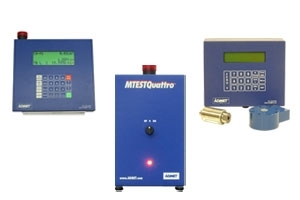 Controllers, as the name implies, control how the test frame behaves during testing, including test speed and displacement. In some situations, an indicator may be all that is required. Indicators capture and display the test data but do not control the machine. 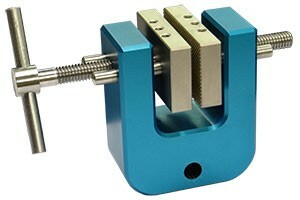 There are many types of grips and fixtures available for tension testing. Different materials require different fixturing to properly hold them. For instance, a sample made of metal requires different grips than a stretchy piece of rubber due to how the materials behave as tensile forces are applied. Selecting the correct grips for your application is crucial in achieving accurate results. 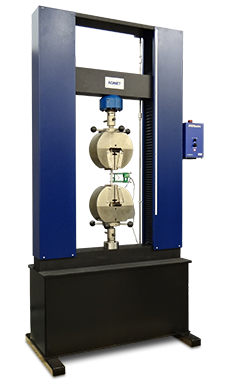 The eXpert 7600 series single column testing machines are capable of performing tension, compression, flexure and peel/adhesion tests in an affordable and compact package. These machines are popular among quality control professionals due to their reliability, data repeatability, and quick return on investment. 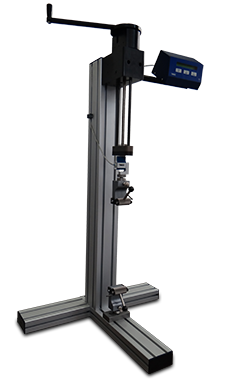 The eXpert 2600 series universal testing machines are available in table top or floor standing configurations from 2 kN to 300 kN. A simple yet customizable design allows for lower cost, faster delivery, and years of maintenance free operation. With the eX5M Mechanical Force Tester, classrooms can now be equipped with an affordable and effective piece of technology which enables students to receive both visual and tactile feedback during testing. Students can experiment and compare results from a variety of testing configurations and speeds, leading to a deeper understanding of materials properties and testing. 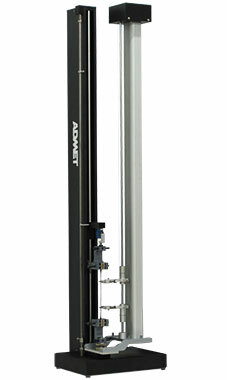 ADMET’s Technical Support and Engineering teams will help you get the most value out of your testing machine. 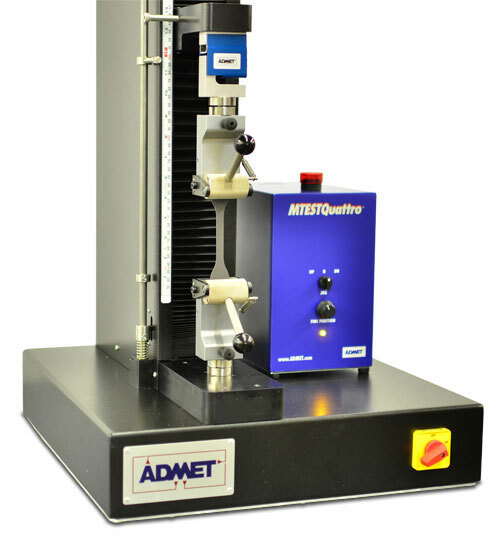 All ADMET machines come with lifetime application support so you can rely on our decades of experience when setting up a new test. 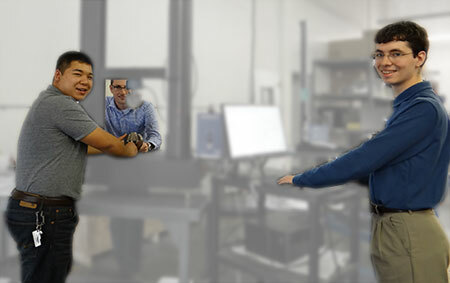 If you have an unusual test application, our engineering team will work with you to design a custom testing machine that fits your unique needs. It’s our goal to help you meet your material testing challenges as easily as possible. 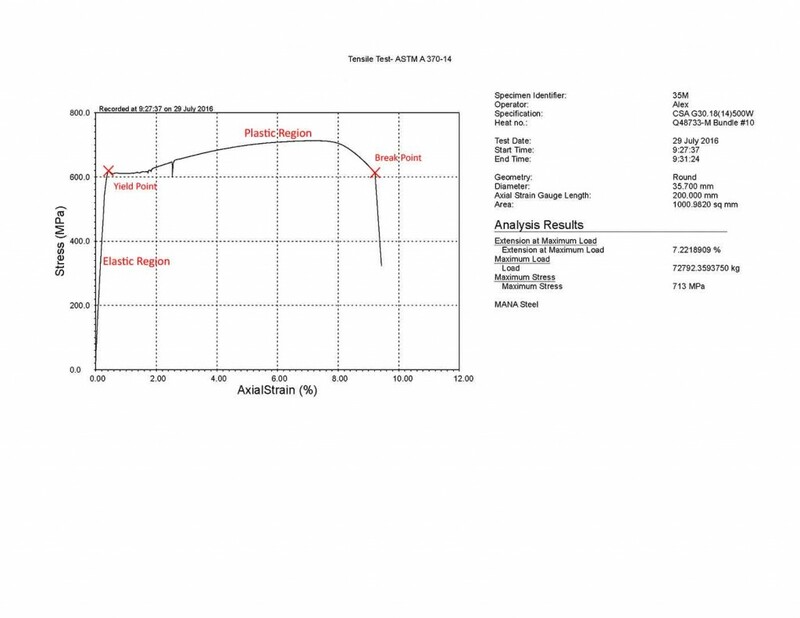 Just have a quick question about tension testing?